Quantum RCU3000B Remote Control offers limited control and status updates, for underway stabilizer operations, away from the bridge. Quantum ARC3000 - Adaptive Stabilizer Control, collects vessel roll motion data to then initiates a "corrective action" response to the stabilizer. Quantum stabilizer systems include a Fin Control Module (FCM) for each stabilizer unit. The Fin Oscillation Simulator (FOS) allows local control of a Quantum stabilizer unit for testing, service, and commissioning. 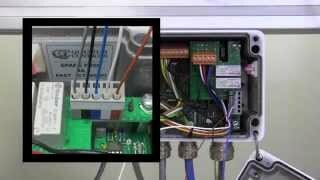 This video shows how to modify an FCM to connect a FOS. The FOS uses hydraulic power from Quantum's QuietPack hydraulic power unit to move a fin and actuator under control of a local operator. 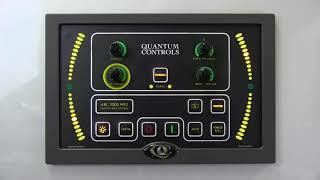 Quantum stabilizer systems provide ride and comfort control for yachts, and for commercial and military vessels. Use and operation instructions for Quantum Stabilizers Fin Oscillation Simulator. 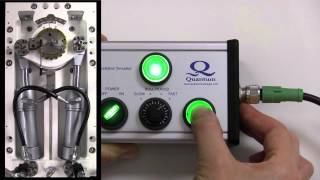 Quantum's FOS, a handheld diagnostic and commissioning tool, uses hydraulic power from Quantum's QuietPack hydraulic power unit to move the fins under the control of a technician or engineer to adjust and service Quantum hydraulic fin stabilizer systems for yachts, and commercial and military vessels. 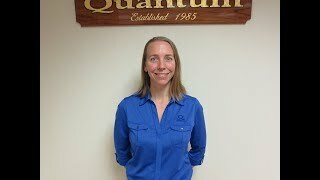 This video shows how to safely connect and operate the FOS.